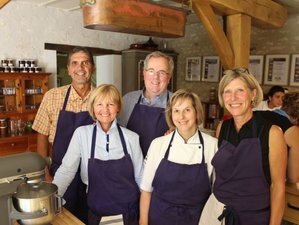 You will embark with Le Calabash on a culinary tour throughout France that will introduce you to a world of new flavors and techniques. You will gain new skills during your hands-on cooking classes that will enable you to follow your own flair and imagination back home. Throughout this authentic food tour of some of the most enchanting places in France, you will have the opportunity to develop your culinary skills and also sample some of the best French dishes. You will spend your nights in double or twin rooms in different locations in France. Le Calabash strives to ensure you have comfort, service, and attention to detail second to none during your stay. You will be staying in a charming guesthouse in Bayeux and hotels in Bordeaux, Avignon, Nice, Lyon, and Paris. Relais ‘Manor House’ is a Charming 18th-century coach inn, just three minutes from Le Calabash, that has been renovated to the most modern standards of comfort to provide one of the regions finest hotels. However, the owners have ensured it has retained its charm and character. Set in the small tranquil French village of Yzeures-sur-Creuse on the river Creuse in the Loire Valley, it overlooks the village square and church, which includes a 15th-century shrine and the Museum of ‘Mado Robin,’ France’s famous Opera Soprano as this is where she was born. The beamed bedrooms are all of a superior standard and decorated in period style, with en-suite bathrooms, air-conditioning, Wi-Fi, and flat-screen TV. The bar and lounge offer a comfortable area to relax with a grand fireplace or enjoy the calm of one of the two picturesque gardens with a glass of Loire wine. If you enjoy the outdoors, you have a swimming pool, tennis court, and you are provided with canoes to explore either the Creuse or la Gartempe Rivers or discover the area by bicycle on the numerous cycle routes which are also provided. You are on the doorsteps of the Brenne, famous for its bird life, lakes, and endless walks. Les Loges du Parc is a charming hotel situated in the center of the pretty spa town of La Roche Posay. The hotel with its imposing ‘Belle Epoque’ façade, surrounded by its rose garden and pivoineraie, thermal pool and a large terrace with linden trees creates a unique and exceptional place in the village. Completely renovated in a chic country spirit with a hint of a “British Touch”, it offers tasteful large hotel rooms and suites where each room has its own identity; wood, amaranth, coriander, green countryside. The exterior has kept its Art Nouveau charm with its architectural frieze. The hotel offers a relaxing pool and bathing area where guests can soak up the French Sunshine. Inside there is an atmosphere of peace and authenticity with the solid wood floors and fireplace in the lobby. It is comfortable with character and charm. Les Loges du Parc is part of the prestigious Châteaux & Hôtels Collection (Alain Ducasse Group). At 10:00 a.m., meet your hosts, Alison and Sidney, at Charles de Gaulle Airport. You will then make your way to Normandy, where you begin your Culinary Tour de France in the picturesque village of Camembert. A soft, creamy, surface-ripened cow milk cheese, Camembert is a true symbol of France. In just two centuries it has become so familiar to the people that it is now considered part of France's national gastronomic heritage. A local specialty that is also very popular beyond borders, it is paradoxically the epitome of French refinement. In 1791 during the French revolution and just a short distance from here in Beaumoncel manor, Camembert was born out of an encounter between a cantankerous priest and Marie Harel, a farmer living in the Auge. In the heart of the village of Camembert, a late 18th or early 19th-century building has been restored to become home to the Maison de Camembert. It offers a showcase for the most emblematic of French cheeses and pays tribute to Marie Harel in the historic place in which this great saga began. At 2:00 p.m., you will visit a dairy farm that is still producing raw-milk, ladle-moulded Camembert cheese traditionally in the village of Camembert. You will enjoy a guided tour and taste the Camembert. Then you leave Camembert and head to Victot-Pontfol. At 4:00 p.m., you will visit a family domain of over 30 hectares where they have been making Normandy’s famous Cider, Pommeau, and Calvados for many years. You will enjoy a tasting paired with local cheese, charcuterie, and patisseries. Later you will make your way further up to the coast where you will check into your charming guesthouse in the picturesque town of Bayeux. Then at 8:00 p.m., you will enjoy dinner in a traditional French restaurant. At 9 a.m., after breakfast, you will visit Omaha Beach, one of the Normandy landing beaches during the Second World War. Omaha Beach was the most intensely fought after beach on D-Day on June 6, 1944. Omaha Beach is six miles wide, the largest of all five beaches. The whole of the beach at Omaha is overlooked by cliffs which made attacking the area very difficult. The Americans were given the task of doing just this. Many of the soldiers drowned during the approach from ships offshore or were killed by defending fire from German troops placed on heights surrounding the beach. By nightfall, the Americans had gained a hold on the beach and its immediate hinterland. They suffered 2,400 casualties at Omaha - and this is mainly why the attack is remembered today. It is easy to overlook the fact that despite the casualties, 34,000 troops had been landed by the end of the day on this blooded beach. You will also visit The Normandy American Cemetery and Memorial in France located in Colleville-sur-Mer, on the site of the temporary American St. Laurent Cemetery, established by the U.S. First Army on June 8, 1944. This is the first American cemetery on European soil in World War II. The cemetery site, at the north end of its half-mile access road, covers 172.5 acres and contains the graves of 9,387 military dead, most of whom lost their lives in the D-Day landings and ensuing operations. On the Walls of the Missing, in a semicircular garden on the east side of the memorial, are inscribed 1,557 names. Rosettes mark the names of those since recovered and identified. After enjoying a picnic overlooking the beach, you will be spending your afternoon at the renowned Mont Saint Michel, where you will be free to explore the island. The Mont Saint Michel is one of Europe’s most unforgettable sights. Set in the mesmerizing bay where Normandy and Brittany merge, the island draws the eye from great distances. The island has held strategic fortifications since ancient times, and since the 8th century AD has been the seat of the monastery from which it draws its name. It is listed as a World Heritage Site. Dinner is for your own account. You will meet up and leave the Mont Saint Michel at 9:00 p.m.
At 8:00 a.m., after an early breakfast, it is time to leave for Le Calabash, Alison and Sidney’s cooking school set in the Loire Valley, the heart of France’s finest food region. You will enjoy hands-on cooking classes with award-winning chefs in a pleasant and peaceful hamlet. Arrive in the Loire Valley by 12 p.m., in time to enjoy a light brasserie-type lunch in the local restaurant. This afternoon you will master the art of soufflés, a culinary specialty known for their lightness. You will also learn how to master one of Le Calabash’s renowned ice creams. Tonight you dine at 7:30 p.m. with the Bonds' friend, Michelin-starred Jacky Dallay at the renowned Promenade Restaurant in Le Petit Pressigny. At 08:30 a.m., Sidney will share with you three traditional French Bouchon dishes. Then at 12:00 p.m., you'll enjoy one of these delicious dishes for lunch. Depart at 1:00 p.m. for Chinon, where you will have the afternoon to explore the Abbey of Fontevraud. This afternoon you visit The Royal Abbey of Our Lady of Fontevraud. Fontevraud was a monastery in the village of Fontevraud-l’Abbaye, near Chinon. It was founded in 1101 by the itinerant preacher Robert of Arbrissel. The foundation flourished and became the center of a new monastic order, The Order of Fontevraud. This order was composed of double monasteries, in which the community of both women and men, in separate quarters of the abbey all of which were subject to the authority of the Abbess of Fontevraud. The first permanent structures were built between 1110 and 1119 and the area where the abbey is located was then part of what is sometimes referred to as the Angevin Empire. The King of England, Henry II, his wife, Eleanor of Aquitaine and son, King Richard The Lionheart were all buried here at the end of the 12th century. It was disestablished as a monastery during the French Revolution and would then go on to become one of the world’s most notorious prisons. At 4:30, you will enjoy a wine tasting in Le Château du Petit Thouars, family owned since 1636, and a visit to their vineyards in Chinon. Dinner will be at 8:00 p.m. at Le Calabash. You will begin your day with an early morning coffee at Le Calabash before departing for Tours Market, one of the finest in France. Visit Tours' best bakery to choose your breakfast pastries, which you will enjoy in a little market coffee shop. This morning, you will explore both the indoor Les Halles Food Market and the twice-weekly outdoor market. Visit the old town which clusters around Place Plumereau; its old houses restored to their former glory. Today this is the place for pavement cafes and people watching in the summer, but you will also stroll the smaller, narrow streets like Rue Briconnet and you will step back into the historic medieval city. To the south, you will find a Romanesque basilica, the Cloitre de St-Martin and the new Basilique de St-Martin. You are in the place which was once on the great pilgrimage route to Santiago de Compostela. St-Martin was a soldier who became bishop of Tours in the 4th century and helped spread Christianity throughout France. His remains, rediscovered in 1860, are now in the crypt of the new Basilique. The other old part, the cathedral quarter, on the other side of the main Rue Nationale, is dominated by the Cathédrale St-Gatien, a flamboyant Gothic building with 12th-century decorated stonework covering the outside. Inside, the highlights are the 16th-century tomb of Charles VIII and Anne de Bretagne’s two children, and the stained glass. For lunch, you will enjoy a traditional French meal at Le Calabash, prepared by Alison. At 2:00 p.m., Alison will share with you her passion for creating and preparing one of the world’s most sought-after classics, the macaron, on which she has put her own stamp. At 7:30 p.m. tonight, you will have a chocolate and wine pairing and certificate presentation followed by the Art of Paella, by Le Calabash. Chocolate is the confectionery match to wine. Perhaps this is because the process of making chocolate is very similar to wine. Both cocoa beans and wine are fermented with the very same type of yeast. No wonder there are so many wine and chocolate lovers! Paella is a Valencian-Catalan word which derives from the Old French word "paelle" for pan, which in turn comes from the Latin word "patella" for pan as well. Valencian paella is believed to be the original recipe and consists of calasparra rice, green vegetables, chicken and rabbit, land snails, beans and seasoning as saffron, rosemary, and, occasionally, lemon. At 08:30 a.m., after the traditional French breakfast, you will depart and drive to Saint Emilion. You will have lunch at 1:00 p.m. in Saint Emilion on your own account. You will visit Les Cordeliers, a preserved 14th-century cloister, based in the heart of this picturesque World Heritage Site. This spectacular site also includes gardens and a network of underground cellars and passages where superior sparkling wines have been produced since 1892. A guided tour of all the underground cellars and passages is the perfect way to learn all about the history of Les Cordeliers and get to know about the traditional wine-making techniques. This trip to the heart of St. Emilion will be followed by a wine tasting on the patio or in the leafy garden. This afternoon you take a stroll through the streets of Saint-Emilion’s World Heritage town. Saint Émilion’s history goes back to prehistoric times and is a UNESCO World Heritage Site, with fascinating Romanesque churches and ruins stretching all along steep and narrow streets. The Romans planted vineyards in what was to become Saint Emilion as early as the 2nd century. In the 4th century, the Latin poet Ausonius lauded the fruit of the bountiful vine. The town was named after the monk Émilion, a traveling confessor who settled in a hermitage carved into the rock there in the 8th century. It was the monks who followed him that started up the commercial wine production in the area. You head to your hotel in the beautiful city of Bordeaux. At 8:30 p.m., you enjoy dinner at Gordan Ramsay’s brasserie. Respectful of the quality and freshness of local and regional produces, the menu of Le Bordeaux Gordon Ramsay proposes specialties of South-Westen France with a British touch. Among the favorites on the menu: the Beef Wellington to share, Caesar salad, or the famous fish and chips will be on offer. Concerning the desserts list, Arthur Fèvre revamped some traditional recipes: Spring “Gariguettes” (a flavorsome type of strawberry), lemon tart, chocolate fondant. The wine menu offers a large range including a fine selection of Bordeaux wines. At 9:00 a.m., after breakfast, you will make your way to Dune du Pilat, which is 117 meters at its highest point, this is the tallest sand dune in Europe. At the top, a gorgeous panorama over the bay, the ocean, and endless pine forests will reward you for your efforts. You drive to Arcachon to sample fresh oysters, for which this area is famous. Meet the oyster producer and learn more about the traditional methods of oyster cultivation while enjoying fresh Arcachon oysters accompanied by a glass of local white wine. Then enjoy lunch onsite overlooking the beach. Head back to your hotel where you will be free to make your own plans for the evening. Of course, your hosts will be on hand to help you with your restaurant choices. Dinner is for your own account tonight. At 8:00 a.m. after breakfast, you will head to the medieval town of Carcassonne. Occupied since the Neolithic, Carcassonne is located in the Aude plain between two great axes of circulation linking the Atlantic to the Mediterranean sea and the Massif Central to the Pyrénées. Its strategic importance was quickly recognized by the Romans who occupied its hilltop until the demise of the Western Roman Empire and was later taken over in the 5th century by the Visigoths who founded the city. Also thriving as a trading post due to its location, it saw many rulers who successively built up its fortifications, until its military significance was greatly reduced by the Treaty of the Pyrenees in 1659. You have the afternoon to discover this beautiful town, before heading off to Avignon in Provence. Lunch is for your own account, you could choose to enjoy Cassoulet, one of the dishes the area famous for. Cassoulet is a rich, slow-cooked casserole originating in the south of France, containing meat (typically pork sausages, goose, duck, and sometimes mutton), pork skin, and white beans. The dish is named after its traditional cooking vessel, the cassole, a deep, round, earthenware pot with slanting sides. The region once known as the province of Languedoc is the traditional homeland of cassoulet, especially the towns of Toulouse, Carcassonne, and Castelnaudary, the town which claims to be where the dish originated. You will then check into our hotel on arrival. At 7:30 p.m., Alison and Sidney will take you out to dinner in a traditional French restaurant. Starting at 9:00 a.m., this morning you are free to go back through history in the medieval town of Avignon, which is known as a World Heritage Site. Discover the ‘’Palais de Papes’’ from the 12th century, the Cathedral of Avignon and the famous ‘’Pont d’Avignon’’. At 11:30 a.m., you meet before lunch. You will visit a producer of local olive oil where you will enjoy a lunch on the terrace under the Provençale sun. The olive oil mill of the Chartreuse is one of the oldest in France still in activity. It was created in 1358 by the Cartesian Order with the benediction of Pope Innocent VI. In 2009, the buildings housing the olive oil mill were listed with the Historic Monuments of France. In 2008, the Bronzini family took over the Olive Oil Mill and worked at furthering the quality of its traditional production. For this, they have been granted several awards, such as a gold medal for products of excellence and a silver medal. In 2010, Philippe Bronzini undertook considerable restoration work in order to enhance the historical parts of the building all while modernizing the production equipment. You then leave this historical town and make your way to ‘’Nice la Belle,’’ the beautiful city of Nice. Check into your hotel and freshen up before taking a stroll along the outstanding Mediterranean seafront on the Promenade des Anglais with its many bars and restaurants and, of course, the famous Moules et Frites. Dinner is for your own account tonight. At 9:30 a.m., after breakfast, you will take a walk through the Niçoise markets. At 1:00 p.m., you will enjoy a light lunch in the heart of Nice in a vintage-inspired restaurant which offers a delicious menu made solely using seasonal produce. The rest of the day and evening you are free to stroll around the city, do some shopping, have a drink on the famous Promenade des Anglais or simply relax and enjoy the beach. This evening you can make your own plans for dinner, your hosts will, of course, give you any advice you need. Dinner is for your own account tonight. Today you have the whole day to yourself to relax and enjoy Nice. With its mix of real-city grit, old-world opulence, year-round sunshine, and stunning seaside location, Nice is the unofficial capital of the Côte d’Azur and a must-see for every visitor. A magnet for sunseekers and high-rollers since the 19th century, this bewitching coastal city has so much going for it, it's almost embarrassing - fabulous markets, an enticing old town, glorious architecture, and a wealth of super restaurants. Places of interest are La Promenade des Anglais, which takes you all the way down the beach front, you can stop have a drink or go and lie on the beach. It is possible to book a lounger on the hotel’s private beach, this must be done the day before. You can visit the Palais Masséna, which tells the Nice story from Napoleon through to the mid-20th century. You could take a stroll through the old town or better known as the “Vieux Nice”, the market also takes place in this area “Le Cours Saleya”. Filled with bars, coffee shops, small restaurants, boutiques, souvenir shops. Nice also has a few museums such as the Musée Chagall or the Musée Matisse. Nice is also home to gorgeous monuments and buildings, all over the city, in the old town, one of the hotspots would be the Russian Cathedral, it is the most visited monument in Nice, the cathedral’s interior “symbolizes the universe returned to its initial beauty through the grace of the Risen Christ”. This was clearly an initial universe as conceived for Russian tastes - very gold, shiny, studded with jewels and other treasures brought from Russia. At 8:00 p.m., you will meet and enjoy dinner in a Michelin star restaurant. At 8:00 a.m., you will have a fairly early start for breakfast after which you depart for one of France’s major cities for French cuisine, Lyon. You will head to Tain l’Hermitage and le Cité du Chocolat, home to the best chocolate in the world, Valrhona. At 12:30 p.m., you wil have lunch in a local creperie. Located on the site of Valrhona’s historic chocolate factory, the Cité takes the general public and professionals on a behind-the-scenes exploration of Fine Chocolate. During a mouth-watering, eye-opening trail through the heart of the Cité, you will discover all the secrets of how chocolate is made and the array of expertise possessed by Valrhona and its customers. Whether you’re a gourmet enthusiast or simply love chocolate, whether you’re an amateur or a professional, come and savor a magical experience with this most exceptional of ingredients! The Valrhona boutique is located within the Cité du Chocolat, exactly where it has stood since the 1950s. Enjoy preview tastings of the brand’s latest products, explore the complete Valrhona range and the book area or pick a souvenir of Debuyer pastry utensils, as well as biscuits and marshmallows made with Valrhona chocolate. Afterwards, you will check into your hotel. At 8:00 p.m., tonight you will enjoy dinner in a traditional Lyonnais Bouchon. A Bouchon is a little, family-owned bistro and cannot be found in any other French city. They are the only place to taste and enjoy traditional homemade Lyonnais meals. The forbearers of these bouchons were the taverns or inns where silk merchants stopped in the 17th and 18th centuries to have a meal, clean their horses, and, perhaps, rest overnight. They derived their name because the term bouchon was used then to describe the twisted straw brushes used to clean the horses. Each year, L’Association de defense des Bouchons Lyonnais certifies those bouchons that meet its standards of authenticity. The restaurants, which number around 20, proudly display their designation on their windows. After a leisurely breakfast, you will be taken on a visit to the Vieux-Lyon. You will walk through the famous cobbles alleyways of the Saint Jean area, via its internal courtyards and traboules. You will discover the atmosphere which is very characteristic. Urbanized as early as the Middle Ages, the area now boasts 24 hectares of buildings mainly dating back to the 15th and 16th century, combining Gothic and Renaissance architecture. Go back to the times of the great fairs that secured the wealth and celebrity of the city and relive the history of leading local and Italian families who left their mark here. Secrets will be revealed and anecdotes that have made the reputation of this historic area, which is the first area in France to have been preserved and inscribed on UNESCO's World Heritage List. At the end of the morning, you will head to the famous market Les Halles. In 1971, Les Halles was opened in the neighborhood of La Part-Dieu close to Lyon’s main train station. Extensive renovations took place in 2004 resulting in the now 13,000 square meters of food vendors over three floors. The final touch was undoubtedly master chef Paul Bocuse adding his name to the title of the market and securing its reputation as one of the finest places for food anywhere. Les Halles is a remarkable indoor food market offering the very finest produce available anywhere. The several bars and restaurants make this an ideal location to sample Lyon’s gastronomical delights and it’s as well suited for a family visit or a romantic evening. You will be able to enjoy a light Lunch from the many stands at Les Halles (for your own account). You will have the afternoon free to discover Lyon. At 8:30 p.m., you will dine at Paul Bocuse’s renowned 3 Michelin star restaurant. Paul Bocuse is the King of Chefs and Chef of Kings. He has held his three Michelin Stars since 1965 and is known as one of the greatest chefs in the world. At 8:00 a.m., you will have an early departure after breakfast to the City of Lights, Paris. At 2:00 p.m., you will take part in a cheese and wine tasting workshop in a 17th-century cave. You will then check into your hotel, where you can freshen up before dinner. The afternoon is yours to enjoy Paris. At 8:00 p.m., you will enjoy a picnic on the lawns of the Eiffel tower. At 10:30 a.m., after a leisurely breakfast, you will meet your guide who will be taking you on an exclusive food tour through Paris’s best pastry, chocolate, charcuterie, and cheese shops. At the end of this tour, you will enjoy lunch with all of these specialties while being told about the history and stories behind them. You will visit Rue Montmartre, home to Paris’s kitchen and chef shops, where you can purchase some of the small pastry and kitchen pieces of equipment you may need to prepare your meals back home. At 8:00 p.m., for your last evening, you will have a farewell dinner at the famous Le Train Bleu, where you will reminisce on your culinary adventure through France together and make a toast to all those wonderful memories! After breakfast you will say farewell. Sidney is an award-winning chef, with many years of international experience. Since meeting his future wife in Swaziland, they have cooked together, including for several heads of state, among which Her Majesty Queen Elizabeth II, the Duke of Edinburgh, and Prince William, as well for celebrities like Madonna, Cher, and Sylvester Stallone. Apart from the recognition of major food guides, Sidney has won international medals. Sidney was Captain of The British Craft Guild Team for 2000/2001 when they achieved a record medal total. This food tour will take place in various locations throughout France, namely Normandy (with Camembert, Bayeux, Omaha Beach, Mont Saint Michel), the Loire Valley (with Villandry and Tours), Saint Emilion, Bordeaux, Dune du Pilat, Carcassonne, Provence (with Avignon), Nice, Lyon, and Paris. Meals are included as indicated in the itinerary as well as half a bottle of selected wines with meals as indicated. For the days on which dinner is not included, Le Calabash will give you any advice you need with choosing a restaurant. There will be plenty of cheese, oyster, wine, and chocolate tasting sessions throughout this food tour. In Nice you will have some free time to stroll around the city, do some shopping, have a drink on the famous Promenade des Anglais, or simply relax and enjoy the beach. You will also have a free afternoon to discover Lyon, here are some tips. The Fourvière Basilica - this magnificent church ever visible on the Fourvière hill to the west of the city, is one of a series of iconic hill-top churches built in major French cities in the late-19th century. The basilica is in the oldest part of the city, Lyon’s pilgrimage site and where several Roman sites have been discovered. Musée des Beaux Arts - housed in a former abbey from the 1600s, the Musée des Beaux-Arts is France’s largest fine art museum after the Louvre in Paris. There are 70 rooms here, with paintings from the 1300s to the 1900s, sculpture, and displays of both Egyptian and Oriental art. You don’t need more than a passing knowledge to be impressed by the wealth of famous French and European artists on show: Degas, van Gogh, Renoir, Cézanne, El Greco, Canaletto, Picasso, Max Ernst, and Francis Bacon, and that’s just an overview. The Antiquities department is a trove of some 600 Ancient Egyptian artifacts, including reliefs, busts, statuettes, and sarcophagi, as well as monumental gates recovered from the Medamud temple. Lyon Cathedral - the city’s fabulous cathedral is a mostly Gothic construction built between the 12th and 15th centuries. The majority of the original stained-glass windows are still here and date to the 1300s. They had been dismantled and packed away during the Second World War to save them from bomb damage. The most captivating are the north, south, and west roses, as well as the apse’s lancet. The astronomical clock inside is 9 meters tall and was installed in the 1300s. Under the main clock-face is an astrolabe, added in the 1600s, that can show the position of the earth, sun, and moon. Lyon is also home to many great boutiques and shops in Le Carré d’Or area, in the Vieux Lyon area and La Croix Rousse area. The rest of the payment should be paid 35 days before arrival. Embark with Le Calabash on a culinary adventure that will open new doors to flavors, techniques, and skills that will enable you to follow your own flair.